Ontario storytellers gather each Spring to enjoy an afternoon medley that includes a workshop, storytelling circle, and time to mix and mingle. Delicious light refreshments are served. 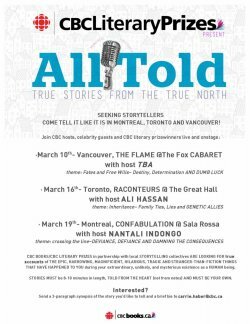 Ottawa Storytellers is hosting this year's gathering and are pleased to offer billeting to those traveling. SC-CC has heard from author Ruowen Wang who has formed a Canadian teaching team in Toronto. They will travel to a few cities in five or six weeks, delivering three or four workshops for ESL teachers in China. The group would like to invite a Canadian storyteller to join the trip. is pleased to present an evening in support of StorySave. 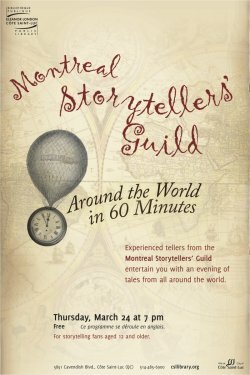 Experienced tellers from the Montreal Storytellers’ Guild entertain you with an evening of tales from all around the world. Free Ce programme se déroule en anglais. For storytelling fans aged 12 and older. Tales for the Telling: Turn Your Radio On! Rain City Chronicles presents stories inspired by The Smith's The Queen is Dead.